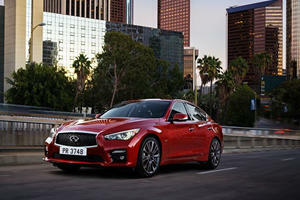 The Infiniti Q50 has been much maligned, and currently resides near the back of many enthusiasts’ list in the hyper-competitive sports sedan segment. But is this position deserved, and if so, why? Sure people are aware of its existence, and that, like most of the brand’s models, the aesthetics are pleasant and performance is good. 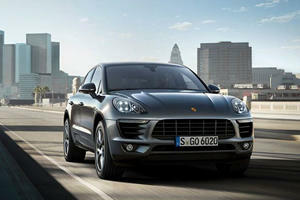 Sales are respectable, decent even considering its entrenched Teutonic rivals. So why does the Q50 languish, and where does that leave Infiniti? The premium sport sedan segment remains one of the most cutthroat in the industry. Every automaker is vying for the crown held for decades now by the BMW 3 Series. Hitting the showrooms in late 2013, the Q50 has been largely unnoticed. However, it has a winning chassis and serious performance delivered through the rear wheels, all the while wrapped in eye-pleasing sheet metal. Compared to its Japanese rival, the polarizing Predator-mouthed Lexus IS, most don’t give the entry from Nissan’s luxury division its fair due. Maybe that’s about to change. OK, while the majority of consumers are not card-carrying enthusiasts, they do know these Japanese vehicles for what they are: unfailingly reliable, well engineered and priced fairly. 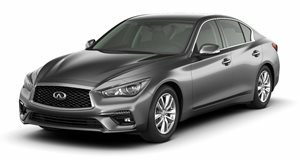 Not afraid to push the top of the pack, Nissan/Infiniti has taken a close look at the Q50 and its powertrain in particular. The 2016 models have major changes under the hood. The result will please many, so expect the Q50 to be a player. Gone is the potent, but outdated, VQ series engines. They have been refashioned and range from entry level to plain hot. For 2016 the Q50 offers a solid 2.0-liter turbocharged four-cylinder that churns out 208 horsepower and 258 pound-feet of torque. Things get bigger, and better from here with a choice of two 3.0-liter twin-turbo V6s offered in 300 or 400 horsepower variants and producing 295 and 350 pound-feet of torque, respectively. This uprated variant of the turbo six-cylinder takes aim at Audi’s upcoming B9 S4, BMW’s 340i, and the Mercedes-Benz C450 AMG Sport. This is a bold approach and heralds a do or die moment for the Q50. Updates to the Infiniti's chassis via the tongue-twisting Dynamic Digital Suspension and Direct Adaptive Steering System will provide a more fine-tuned steering feel and adaptive suspension for varying driving conditions. The updates to the chassis and powertrain are not all that Infiniti proposes as the car's safety systems have been updated as well. As said at the outset, this is a particularly brutal segment, one that appears to take no prisoners. It is to Infiniti’s credit that they have invested in the goods, and the verve to engage. You will hear more, but don’t just listen to others, go drive the Q50 for yourself. Take a lesson from Volkswagen and avoid cutting corners when it comes to emissions. 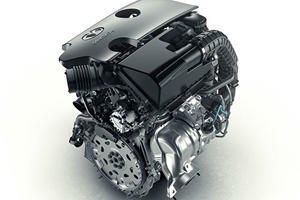 Has Infiniti Just Revealed The Most Important Engine Of 2016? It may look like a humble turbo-four, but this motor's an engineering masterpiece. Can The 400- Horsepower Infiniti Q50 Match The Germans? With a new engine, is the Q50 finally perfect?